On my first Sunday in the States, during prayer I was stunned when I realized my brain was automatically translating the English prayers into Creole. That’s not ‘normal’ in the States, yet my brain was so used to working hard every Sunday to help me understand the Sunday services that there was no hesitation that translating into Creole was the expectation while I was hearing English. Last week when I was sitting in traffic, my default reaction was park the car and walk to the front to see if the roadblock was getting cleared or if it would be a long time before it was removed. When I realized that was CULTURALLY INAPPROPRIATE FOR COLORADO, my next default was, ‘Ok, wave someone down going the opposite direction to find out what is causing the problem.’ Which was ALSO wildly culturally inappropriate for the States. Though who wouldn’t want to see the crazy redhead waving her arms to get someone to stop, then get arrested and tossed in the psych unit. Again…not ‘normal’ in the States. As I’ve been driving around Colorado Springs looking for an apartment I had expertly spotted an ‘apartment complex’ in the distance around an area I liked, then threaded my way through the streets to get to it. Only to find…it was a big house. Not an apartment complex. Being startled by moderately sized, yet large, single family homes is not a ‘normal’ thing in the States. Certainly mistaking them for apartment complexes is way outside normal thinking. I had spent two and a half years training my brain to understand enough Creole to communicate with my friends, instead of using a translator. Imagine the relationship difficulties in having to use a translator every time you want to communicate…not really effective to make real friends for the long-term. That’s a lot of intentional speaking that doesn’t get turned off with the simple flip of a switch, so when I am told, ‘We don’t speak that here,’ it hurts. True confession, of course sometimes I do it to be ornery, so sure, be sarcastically mean back, however there are dozens of times a day I think in Creole first, and sometimes the filter is not excellent, leading to speaking Creole out loud. I do find it ironic that the youngest of my friends finds this the most normal, and actually responds to me in English as he guesses what I am saying in Creole, with no comment like ‘what did you say?’ I am controlling it the best I can, there is no reason to be hateful about it, especially since I am not actually trying to offend by not speaking the ‘normal’ language of the States. My new coworkers could have all the reasons in the world to be annoyed by my Haiti life, yet I am the blessed recipient of laughter, joking and grace. While I muddle my way through retraining my brain to what is ‘normal’ in the States, there is a lot of freedom I have gained. I love that I don’t have to put toilet paper in the trash instead of the trash can. I love that I can brush my teeth with water from the sink. I love the smell and feel of clothes fresh out of the dryer with fabric softener…instead of hand washed hanging from the line on the roof. I love the plethora of choices in the stores…yet I am also paralyzed by them. I love that I can drive myself…at ANY time of the day and I’m not restricted by a compound wall. Freedom is a word that keeps running through my head constantly quickly followed by thanking God it exists here in the forms it does. I knew there would be things that caught me off guard as I sunk myself back into the ‘normalcy’ of Stateside culture. I knew there would be things I liked and things I didn’t like. I knew there would be people who would be full of grace and support, and those that wouldn’t understand. I knew that there would be challenges I hadn’t even thought about, and really, only three weeks fresh off the plane, I know there will be many still to come. Within all of that…I’ve come to hate the word ‘transition,’ and maybe it has to do more with the overuse of the word. I know people genuinely care, and are asking to check in, but to me this isn’t a transition. It is simply a different placement within the same calling and Kingdom lived life. It’s not a different adventure…just a different city. I am in Colorado, because I choose to live as a believer surrendering to the life-giving call of being an advocate for kids around the world that are told they are not worthy, they have no value and lack the steady financial support of family due to a myriad of reasons associated with majority world traumas. They are faces and specific names. They are NOT strangers. They are my friends. Some of those kids love Jesus with all they have in them, and others aren’t freely given that opportunity. I choose to live as a believer that accepts God will send me where he needs to use my voice and stories. Which makes the most real challenge of all how to maintain the abnormality that God has renewed and created in me while figuring out how to not become captive of the ‘normal,’ but to find the balance, because the most real answer of all is…I am not the same. The acceptance into another culture. The lack of struggle to navigate unknowns. The things I have seen. The stories I’ve heard. The places God has immersed me. The people I know. The sacrifices made. The pain that has been experienced and observed. The friends I have gained. The respect gained as a woman in patriarchal societies. The arms that have been wrapped around others. The love received and given. The every day reliance on the Holy Spirit. The constant knowledge that Kingdom is real, and it is our responsibility to answer our calling as believers to fight for that restoration. My buddy. My heart. He handled my leaving much better than I did. The ache of leaving and answering ‘why’ a thousand times, while being fractured emotionally over and over, because as much as it would have made leaving much easier, I just can’t stop myself from intentionally pouring into relationships I’ve been given. It is how God has wired me to live. Each of those has made their mark on my life, and I don’t want that mark to get blurred or erased. God never intends to blur or erase those markings, he intends them to shape our story, and my story is definitely not normal. 4 Comments Posted in Haiti, Real. Life. 2 Comments Posted in Community, Haiti, Real. Life. As I have been sent out into other cultures over the last fourteen years, there was a time that I proudly posted this quote from anthropologist Margaret Mead. I would go outside the United States borders, dip my toe into other cultures, fall in love with those cultures in a short amount of time and then return to the comfort of my base culture. Drinkable water from a faucet instead from a bottle, running water instead of the pump down the street, eclectic food instead of the same thing every day, laundry from a washing machine instead of hand washing it and toilet paper that went in toilets instead of trash cans. I even had a pre-trip meal plan and a post-trip meal plan dependent on where I was traveling at the time. I would return stateside, and I most assuredly appreciated my base culture. But after a year and half of living outside those borders, now I find I am struggling with the ideals and reality of my base culture. This will be ironic to some, since Haiti is so drastically different than the states. Reality in this majority world country is full of struggles under an incredibly high unemployment rate that leads families to strip themselves of their God-given dignity when they run out of options and give their child to the care of a children’s home providing clothes, health care, meals, clean water and education. There are a myriad of other issues with government accountability, infrastructure, clean water, health care and interference from well meaning people who are trying to do good but only hurt the populace more. It is hard to put into words how God is molding me down here. I know I am being transformed spiritually, physically and emotionally. I am not a ‘super-Christian’ or a ‘better person’ for living here. Living here is a gift I gratefully accept. All I can really say to people is come and see, because it is not what you expect when you choose to really see past the surface. Haiti has changed the way I look at the world as I choose to see beyond their imposed stereotypes. Haitians are not defined by trash. Decades of cultural acceptance is not going to be reversed by one visitor collecting trash. It is a cultural mindset, and that takes generations to reverse. Haitians are not defined by their politics. Are some Haitians? Yes. As in all cultures there are good and bad politicians, as well as people who are consumed by it. Realistically, most Haitians do not feel the impact of the current political craziness. Do they want government? Yes, in most cases. But in Haiti, being a politician is a job, and some people will do a lot of bad things to gain a job…or keep it. Haitians are not defined by rubble. The earthquake five years ago was tragic, a lot of people lost their lives, and more needs to be done, but most Haitians have a hard time talking about that painful memory. For some, telling the same story over and over again is not bringing healing, but reopening a gaping wound every time. Also, a half built building is not rubble. Buildings are always in progress in majority world countries, because people build with what money they have on hand. If they have money for a load of bricks, they build with those bricks and then save up for the next batch to build more. Haitians are not defined by their country’s impoverished nation status. Do families struggle here? Absolutely. Does that struggle impact their daily life? Absolutely. But it does not define who God has created them to be. They are whole humans, created by God, with a purpose and calling. Poverty does not make them a lesser human than someone born into a wealthy country’s resources. Haitians are not defined by donations. They do want sustainable, living wage incomes. The guilt from outsiders at ‘having so much’ verses what Haitians have, plus the ‘they are so happy’ mentality, does not create a strong economy. However, your sustainable purchased from businesses that are creating jobs here does help their economy. Haiti started exporting bananas again for the first time since 1955 last week. This is a monumental step for the families of those workers. Haitians are hard workers, but need support in creating a strong economy to give sustainable jobs to all. They want an education, but lack the resources to pay for it. Well-meaning donations that flood Haiti have typically taken away jobs…not create them. Most Haitians ARE defined by their salvation in Jesus. Happiness comes from looking beyond this world into the one God will restore, making all things new. Worshipping and praying with them floods my soul with joy, hope and leads me deeper in relationship with my Lord. Realistically, we should all be defined by our salvation in Jesus. So, then, why do we stifle it? I don’t stand on a soapbox with these observations as an entitled American who wants to push my thoughts, habits and perceptions on this culture. The reverse, actually, I am struggling most with my base culture as I learn more about the one I am placed within. I am struggling with the culture of the United States. I don’t like it, and frankly, it feels like Disneyworld when I travel from Haiti. Are there things I enjoy and crave from the States? Of course, but mostly it seems bright and sparkly…and lacking community. It makes me question which place is real and which is not. The stateside mentality is all about speed, and more often than not it feels fake. In Russia’s tourist areas they put up pretty facades in front buildings they are renovating, so no one sees the actual construction. As if the construction would be an assault on our eyes. Not discounting pretty things, but I feel like we do this too often in our own lives. We put up facades on what we are struggling with, whereas others could learn from how God is leading us through our struggle. Maybe that is why I feel led to vomit in this space by tossing my struggle out. I honestly thought my worldview couldn’t be busted open more. I’ve been present and seen the realities of a lot of places over fourteen years. I’ve experienced a lot of cultures and have thousands of stories. I have a lot of international friends who have taught me so, so much. But what I have realized most is that I have so much to learn from other cultures. This week, I thought of that Margaret Mead quote, and sadly, I am ashamed I put so much arrogance in it being true. We should not be motivated to leave ‘home,’ wherever that may be, simply so we love our base culture more. Some could argue I am scrutinizing too steadily and not loving my base culture enough, but we should be motivated to step outside our borders in an effort to dissolve borders between nations and learn about other cultures. Jesus follower or not, every single human should experience other cultures, and not to force our base culture on others. Democracy is not for everyone, and Coke and McDonald’s is not the unifier they appear to be. For believers, you should be inspired to step outside your borders to meet believers from different cultures. I assure you, worshipping as one body of believers will rock you to your soul and your Kingdom perspective will be busted wide open. As I struggle with what version of reality is real, what I do know is it is not about being the same…it is about embracing the differences and learning from each other. It’s amazing how God opens our eyes when our posture is genuine curiosity and building relationships. About two weeks ago I was holding a tiny guy at one of our partner’s villages. The team was laughing at me, because it had already become known that I’m not a ‘baby person,’ yet kept getting handed babies. This particular time, I’d been standing in a group of five Americans, and I was the one passed the baby. However, these few precious moments I cherished, because I knew I was holding someone special. 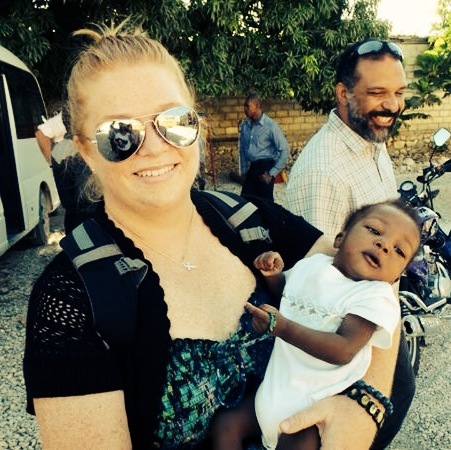 He’d had a rough start to life, more normal in Haiti than many would hope. He and his twin were abandoned, malnourished and admitted to the hospital soon after being left at the Pastor’s village. His twin didn’t make it out of the hospital, but he was a fighter. Many had fallen in love with this fella. What a heartbreaker, ladies! Many were inspired by his story, but then looked into his gorgeous eyes and were hooked. This small fella had defied the odds, with many people fighting for him, and when he came home from the hospital, a God victory was proclaimed for this little one. As I held him, I noticed his hair was growing in better, he had more movement in his limbs when he had been very lethargic for several weeks, had finally started ‘talking’ and the mamas said he was eating a lot. He was about seven months old when he passed away last Sunday. They noticed he had started breathing very hard in church, and grabbed Pastor Kesnel after service was over. They tried taking him to two different hospitals who refused to see him. TWO! The first was full and the second had no doctors on duty, only nurses, so there was no one to diagnose him. Then at the third while they were filling out paperwork…he stopped breathing. 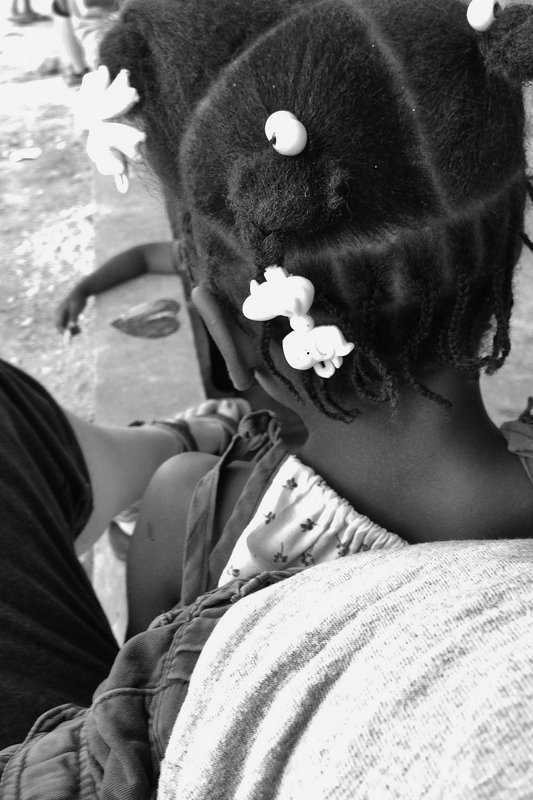 I want to believe that all kids given life have a chance, but in Haiti the odds are consistently stacked against them. It is a hard life for adults here…imagine new, fragile life and the infant mortality rate being high is not surprising. Knowledge of hygiene for newborns is minimal, and places for education on infant care are few. Yet this fella had a Pastor fighting for him, a home to be cared for in and an organization ready to pay any medical bills…yet he still lost his fight to live. My heart is heavy, and I am deeply saddened. I was just holding this tiny, featherweight bundle, in what right now feels like yesterday, and this tiny one had a name. It shouldn’t, but something changes when the oppressed have a name and a face. This I have known for over a decade, but never before have I known one to lose their life way too early. This reality of pain and loss is painful for all involved, but very much the norm in Haiti. They know every aspect of pain and loss in this country. However, thankfully, God has protected the Pastor’s kids that Global Orphan Project supports in astounding ways. Death is not a norm for the villages we partner with here. Yet it invaded our lives this week. But the One we serve knows. God knows Watson’s name. God knows his struggle. God knows his circumstance. God holds him tighter than anyone. God still claims victory over this little life, and that is what we celebrate through Watson’s short life. I believe that God’s heart is for these. Those that have no voice. Those who cannot defend themselves. Those who are told they are not worth the time. Those who are invisible to the world. Those whose unfortunate circumstance brings death so much sooner than we would like. The fight for life in Haiti continues, it will never end until God’s Kingdom is restored. But we continue to fight here, as well as many others all around the world. I am honored to be walking alongside inspiring Kingdom fighters like Pastor and Madame Kesnel, and all of their staff and kids, who are feeling this loss so deeply right now. I am blessed to be a part of an organization of people who care about them, love them and pour into the relationship we have with them. And I am thankful for the small person who pierced my ‘baby bubble,’ etched his name on my heart, and will continue to push me to fight for the kids who have no one to champion them or give them a voice. God proclaims victory, but we have the responsibility to believe it and force the fight forward. Beyond the fact that this is one of my absolute favorite verses, and there are plenty of people that are tired of hearing about it, God tends to reveal different focuses through the words at different times. Being a witness and having a witness are two totally different things. One is what Jesus calls us to be. The other is how our actions are perceived by others. How were Jesus’ actions perceived when he hung out with prostitutes? How were Jesus’ actions perceived when he went to dinner with a tax collector? How were Jesus’ actions perceived when he touched lepers? 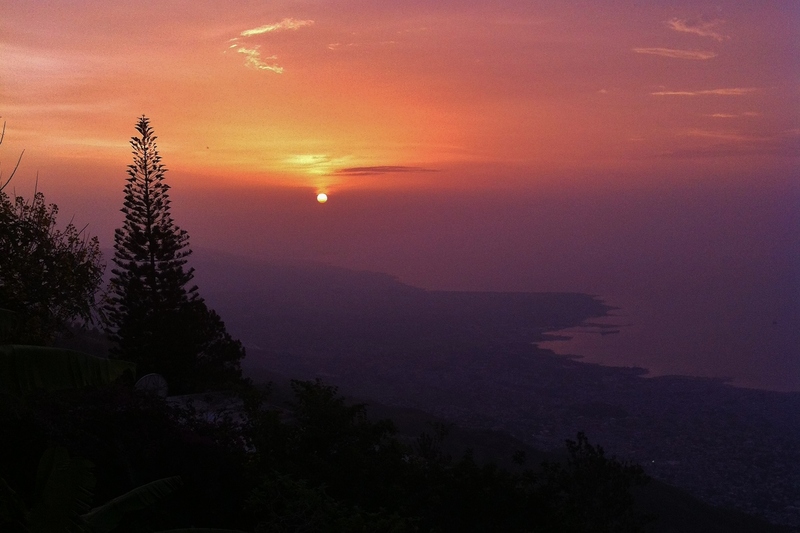 How were Jesus’ actions perceived when he told a murderer he would see him in Paradise? This is why the Pharisees had such a problem with Jesus. His actions went against their ‘rules,’ but what they didn’t understand is that the rules were his to break since the Pharisees had morphed them into something that was never intended. Christians get held to a higher standard, and that frustrates me, simply because we are the ones that know the cost of our sin and live as forgiven believers of the God who reigns over the universe. Just because I choose to be a believer, does not make me less human. It means I am acknowledging who I am as a human, and struggling through the sin that comes so naturally. I cannot stop sinning. That is unrealistic. It also does not make me a hypocrite. It makes me real, and not a believer who feels they have to hide what non-believers would term as questionable behavior for a righteous person. I am not righteous, unless you are saying I respond to injustice…then yes, yes I am. I answer to God alone, which means I rest in his mercy and grace. Believers should be the most real people living in this world. We should be the ones that are an outward example of real grace. In our own lives, as well as giving that grace to others in radical ways. We should be what others look at and say, ‘Maybe there is something to the whole God thing. Maybe he is real. Maybe life could be freeing with God.’ So that God can have that conversation with them, because their salvation is not dependent on us. It is dependent on the truth of the Gospel. I pray you hear that, because we need to get out of the way of God doing what God does. Takes the pressure off, right? Credit for salvation never belongs in the hands of a human. God gets the glory…every time. I was once heading out with a mission team that was a mix of people who find themselves in a pew on Sunday morning, people who would never set foot in church and others who used to but don’t anymore. I love it when God throws those mixes together, because you never know what God is going to do among those people and what transformation will happen while serving. It started a great friendship. It also started a new commitment to church in that team members’ life. All because I am comfortable in the grace I received from a Savior that paid the ultimate price for me, and God breaks through walls that have been built for years in those moments. As well as using the realness we are comfortable with in our relationship with God. I saw a physical wall fall down between that team member and the rest of the team that day. This example has come up a lot through story telling in my missional community. So much so that most of us like the idea of an ‘F-Bomb Ministry.’ I know. Scandalous. Take a breath for a second, and realize this is a solid idea to reach out to people who believe that ‘Christians’ are too good to associate with ‘sinners.’ We are ALL sinners, folks. When we all step back and realized this, God’s glory is going to burst through a redeemed people. I have a filter, and sometimes it is looser than other times. But the reality is there are a plethora of people in this world that hold Christians to a higher standard, because Christians have chosen to fake righteousness. Their righteousness isn’t real. It’s just hiding what they think showing others will tarnish how Jesus is revealed. But consider how Jesus lived. His reputation was awful based on the people he hung out with…but while he was with them the Kingdom of God was evident and a Savior was revealed. The Holy Spirit flowed not only on them, but THROUGH them. The Pharisees were righteous…and look what their beliefs did to not only the believers at the time in martyring them, but in hanging Jesus to a tree. I’m not interested in being fake, and I’m certainly not interested in tarnishing Jesus. Some would argue my inability to filter all cuss words out of my vocabulary is an awful habit for a believer. Others would argue that since I have a penchant for vodka I cannot possibly be able to serve as a witness for Jesus. I respect what God is saying in the lives of others, and I adapt my behavior to show respect to those believers. We are all on a journey with God, and for all I know what he is telling them is what God could be convicting me of tomorrow. However, my journey with God has led me to be comfortable with who he has created me to be and that comfort manifests in all areas of my life. What defines me is his love for me, my love for him and how he has called me to be a witness to what he has done in my life throughout the world. I mess up. I make mistakes. I hurt people I don’t intend to hurt. But at the end of the day, I am embraced by the loving God who unconditionally covers me with love and grace. The God who loves my quirks. The God who, I imagine, laughs when I do stupid things. The God who smiles when I am holding a kid who needs to be held. The God who knows I will go where he sends me. The God who knows when my filter will be slammed in place…and when it won’t. Hope is a strange thing, and a lot of times we find it in strange places. Last summer there was this star I noticed that was tracking with the moon for several nights. It was the brightest star in the sky, and the first to show up at night. For whatever reason, it has been catching my eye every night and has been for months. At times over the last several months as things have spun out of control it has been a constant, beautiful reminder that my life is small and the world is massive…and that is ok. The other day I decided I should figure out the name of the star. And what did I find? 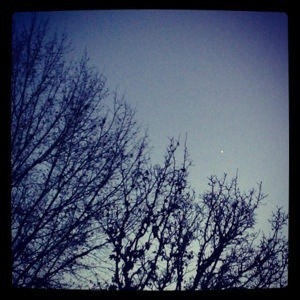 The most ironic thing ever…the star is the planet Venus. That’s right the planet named for the goddess of love and beauty. Seriously? I wish someone could have seen my face. The star that has been twinkling and flickering for months at night, observing my prayers and allowing me to shout…is known for love and beauty. That’s me…who has just figured out that the star I’ve been looking for every night at sunset, as a crazy symbol of hope, is actually a planet named for beauty and love. After much laughter and disbelief over the irony, what I found out is that Venus is actually the least inhabitable planet in our universe. However, they think that Earth and Venus are the same at the core and are about the same size in diameter. I’m not the only one to have had a star obsession. One of my favorite parts of the first few years of Jesus’ life is the wise men following a star to find him. They were looking for him. They traveled a great distance. They trusted that star would lead them. They knew a gift had been given in the form of a baby. Think of the perseverance that would have taken. The money they would have needed to travel that far. The sacrifices they had to make in order to stand in front of Jesus. People had to have called them insane…who follows a star? Incredible, right? What hope they must have had…and they followed a star to find him. God orchestrated the prophecy and the fulfillment of that prophecy in such amazing ways. Here’s to seeking stars, following your calling, trusting God, doing something radical and finding hope through Jesus in the process. Today I was driving and saw the strangest thing. We’ve had millions of birds in KC this year. Many times I have thought I was in the middle of Alfred Hitchock’s ‘The Birds’ movie. It is creepy. Super creepy. 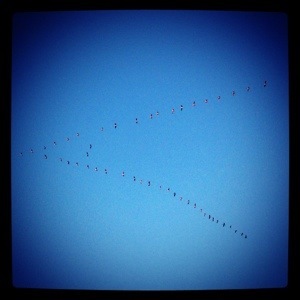 However, today, there were thousands of birds flying in the WRONG DIRECTION. They were very clearly all headed west…not south. Birds are steadfast. The fact that they fly south in the winter, and north in the spring is one of the most reliable things about nature. Yet here they are…in what is not normal behavior for a bird, and definitely not what their ‘instincts’ tell them to do. Shoving the creepy the birds-know-the-apocalypse-is-coming and watch-out-for-zombies feelings aside, I wonder how many times we find ourselves in the exact same position. Finding ourselves going the wrong direction when we know how to get somewhere blindfolded. What makes us go off track? This is the time of year that many people find themselves back among a group of believers when it may have been a really long time since they sought out that type of community. They are seeking something that is missing. Maybe even nursing a God sized hole that they have not been able to fill with anything else. It could have been months…or more likely years. And they are scared…of not being accepted, of being judged and criticized for why they may have been going in the wrong direction. As believers we have the beautiful opportunity to accept them, love them and be ‘normal.’ Normal as in not treating others like people who love Jesus are at a heightened religious level…because it’s Christmas. And normal as in if you are the type of Christian that doesn’t do the whole alcohol thing…don’t draw attention and explain why you are not drinking, just politely decline. Normal as in drop the religious monologue and be present with people. If they want to know what scripture you’ve memorized lately, or what God has been saying to you…they will ask. Read body language and respect not only where people have come from, but where they are at. Ask questions. Be curious. Not because you are ‘suppose to,’ but because you want to. Stop rushing and be present. Be steadfast with the relationships around you. Just because it is Christmas doesn’t mean you have a ‘duty’ to fulfill because of the holidays. Love others and be present to the point of being loyal, faithful and dependable in the lives around you is an everyday thing. God shows up and incredible things happen for the Kingdom of God when we are committed to those around us…whether they believe in that Kingdom or not. Leave a comment Posted in Real. Life.